Despite the mixed reviews for Strange Practice, I ended up enjoying it a lot and was very excited for Dreadful Company. Ironically though, it’s now this sequel that’s making me feel a bit conflicted. It was a fairly good book, though perhaps not great. And I definitely thought the first book was better. 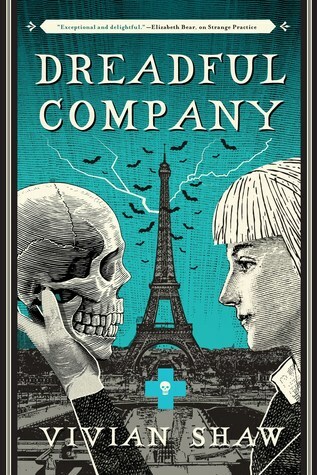 Dreadful Company picks up shortly after Strange Practice ended, once again following protagonist Greta Helsing, London’s monster expert and doctor to the city’s population of paranormal creatures. This time though, she has been called to Paris, where she is scheduled to speak at a supernatural medical conference. Just your typical travel for work, and nothing out of the ordinary—or at least that’s what Greta thought, as she prepares for a night out at the opera with the vampire Edmund Ruthven, her best friend who has accompanied her on this trip. Unbeknownst to them though, Paris’s labyrinthine underground is infested with a coven of unruly vampires, and they have been planning something nefarious for Greta’s arrival. But first, Greta encounters a small gremlin-like creature called a wellmonster in her hotel bathroom, its appearance intriguing her because wellmonsters aren’t typically seen unless they are summoned. Soon though, there are more sightings. Deciding that they warrant further investigation, Greta opts to stay behind while Ruthven returns home to England. But before she can get too far with her inquiries, Greta is kidnapped by the vampires, who are led by a real nasty piece of work named Corvin. Meanwhile, back in London, Greta’s disappearance has been noticed by Ruthven and Francis Varney, the vampyre who has been sweet on the doctor ever since she saved him in the first book. Setting off to find her, the two begin scouring Paris for clues while a parallel mission is also being carried out a pair of psychopomps who are investigating a worrisome influx of phantoms around the area. Dreadful Company and I did not exactly start off on the right foot. Compared to Strange Practice, the beginning here lacked the kind of urgency that pulled me immediately into the first book. While Paris was a nice change of setting and the wellmonsters were adorable and all, I thought this sequel took too long to take off and that on the whole its introduction was pretty uneventful. It wasn’t until Greta was kidnapped that I thought the plot started to pick up. Once the ball got rolling, however, I have to admit things become a lot more interesting. I was impressed at how engaging Greta’s sections managed to be, considering how she spends most of the early parts of the book imprisoned in a cell. The vampires who kidnapped her are given individual backstories and substance, and their presence proves that even in the supernatural world, things are not so simple or black and white. Greta also once again demonstrates why she is a credit to her profession, showing compassion and providing healing to whoever needs it. The worldbuilding was also one of my favorite elements from Strange Practice, and I love it here still. The riveting mix of old and new is alive and well in Dreadful Company, where we’re treated to an eclectic mashup of literary monsters in a modern-day setting. The city of Paris simply adds to this charm, as Vivian Shaw also throws in a few references and deferential nods to several French classics. She’s also expanded the world this time with new characters, and I especially enjoyed meeting Crepusculus Dammerung and Gervase Brightside, our spiritual guides to lost souls. That said, it’s possible that a bit of the novelty and magic has faded since the first book. Part of this is understandable, as there’s a sense that this sequel is more about reinforcing the ideas and themes that have already been established, settling readers comfortably into the world. There’s nothing terribly new or surprising, even a couple reused plot points. And because the characters were all split up, the narrative sometimes had to offer multiple perspectives on the same event, leading to repetition that wasn’t always necessary. Still, my fixed feelings and quibbles notwithstanding, I wasn’t really disappointed. While I didn’t think Dreadful Company was as good as Strange Practice, it retains that special kind of charm which made me fall in love with the first book. It’s what makes Dr. Greta Helsing such a unique urban fantasy series, and plan on sticking with it. It’s definitely a series worth reading! I want to meet a wellmonster. They sound interesting to say the least. Sorry this one didn’t measure up to the first one. I’m still really anxious to read both. The wellmonsters were the best! And even though this didn’t quite live up to book one, I still enjoyed it a lot. I think I remember that you liked Strange Practice more than I did, so this doesn’t bode well for me. Still, I am curious about it so I hope to read it at some point. Yes, I think I did! And yeah, if you couldn’t get into the first one, this one might not be your cup of tea either since it follows the same writing style, tone, etc. I’ve got to get started on this series! It might not be for everyone, but I personally like it a lot! I hope you get a chance to check it out! Yes, it’s often the case when I am introduced to an amazing world the first time, the second time around usually feels a bit duller in comparison. But it’s definitely not a dealbreaker!